Happy May Day! Spring is here! We scraped, painted, dug, planted bulbs, pulled weeds, moved ladders, moved dirt and swept the sidewalk. Lucy's house looks a lot better, thanks to the hard efforts by the Zontians on Saturday, April 26. Altogether we donated 83 hours to the project! I was even shocked by the number when I added it up. That doesn't include the 3 hours I did in preparation, OR the hours of electrical work, OR the time Gary spent on the power wash to the aluminum siding. But Lucy Arellano was thrilled with the results, and that's what it's all about. We laughed, told jokes, ate pizza with dirty hands and bonded as Zontian sisters. We even had fun - even though Helen and I were stiff the next day - and the best part of all: No one even had to open the first aid kit! Thank goodness Teri treated her own blisters at home! We did a wonderful hands-on service for a fellow woman in need, and we should be very proud of our work. Give yourselves a huge pat on the back. Spring also means our fashion show. This year should be our biggest and best ever! We have a bigger room, so let's fill it! This is one of our two fund raisers, so we need everyone's participation. Sell tickets, offer to model, get prize donations and buy raffle tickets. Call Kate for last minute details. See you at Broadmoor West on Saturday, May 10. This is my last president's letter as my two year term ends this month. May 19 we pass on the leadership positions to the new group awaiting in the wings. These ladies will do an outstanding job of moving us forward, always keeping the mission of Zonta uppermost in our minds. But I'm not going anywhere. My Zonta sisters are becoming as special to me as my five real sisters, and you're a whole lot closer. Special thanks to Susie, our newsletter editor, for always making this look so good. 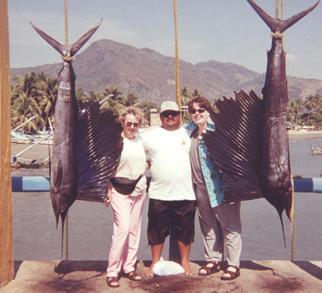 Karen Pauley (right) Past President of Pikes Peak club with 7 1/2' sailfish. Joanne Bass (left) Jefferson County Club President with 6 1/2' sailfish. Mexican boat captain in center. The Zonta Club of Denver invites us to an afternoon matinee of the legendary Broadway Musical Cats on Saturday, June 21 at 2:00 pm matinee at the Temple Buell Theater. Cost: Mezzanine - $60 per person and Balcony - $45 per person. Funds will be used to support organizations sponsored by Zonta Club of Denver. Saturday's crew at Rebuilding Together looked like they had the day well in hand, so I phoned ahead for direction, (Kathy D'Amore's friendly voice encouraged me to come) and high-tailed it for Castle Rock to throw our support behind our compatriots. I am so glad I did. What an exciting vibrant group of involved and committed women we are! (Zontians, I mean.) Our Castle Rock sisters are gracious and I had a wonderful time, from the creative concept of second hand fashions re-invented, the delicious ice cream buffet, and the door prizes and centerpieces, I felt that Spring Fling was a truly original event. Pam Ninness, (treasurer), and Janell Will, (president), made me feel like visiting royalty. I am determined to keep close ties with this group of interesting and determined women! Earlene Herman is well-known for her Color Me Beautiful work, a job she has loved for 21 years. But the Intercept girls probably did not know that the lady helping them had the highest sales performance in the nation this January and February, 2003. Growing up on a ranch in Oklahoma, never in her wildest dreams did she ever imagine that some day she'd be lecturing on cruise ships and telling beautiful ladies what colors were best on them. The Chairman and CEO of CMB, after attending Earlene and Jerry's 50th wedding anniversary celebration, described Earlene as "fashion forward and yet approachable for her clients." In a letter to her following the anniversary celebration, he also told her, "You hold the record for the greatest sales performance in the history of the company (CMB), " and said, "You and Jerry are an inspiration to us because of the way you lead your lives - full of energy and fun." Earlene has served more than 22,000 clients. She has done image consulting with corporations like Hewlett-Packard, Shearson-American Express, Honeywell, USF&G Insurance, Merrill-Lynch and Mitsubishi. Earlene has an accumulation of letters of reference attesting to the fact that she has changed lives, saved her clients money in selecting appropriate wardrobes and makeup, turned around businesses and saved careers. Her experience in charge of Liaison and Protocol for the Office of the US Treasurer, Francine I. Neff (she and Francine were college roommates at Cottey College in Nevada, Missouri) and the American Bankers Association in Washington, D.C. schooled her in the subleties of corporate protocol and business etiquette. Earlene says her greatest reward is seeing the transformation that comes over her clients through their improved self-esteem, confidence and success in their personal and professional lives. Earlene has a Masters Degree in Economic Education, having won many state and national awards for her Creativity in Economic Education and has also taught economics in Frankfurt, Germany. Earlene and her husband Jerry are parents of two grown children, Linda and Lawrence, and have 3 grandchildren and a grand dog, Amber. Here's a funny, but true, story that happened recently. A teenager, Gina, wanted to have a color analysis and makeup party for her 13th birthday. Gina's mom had been a high school student in Oklahoma City when Earlene was teaching there. Driving to Earlene's studio, the mother was telling the girls that Mrs. Herman was a teacher when she was in high school. The mother said there was dead silence...because at 13, they knew Gina's mother was OLD...and, if this color lady was a teacher for Gina's OLD mother...well, they couldn't imagine what this lady would look like. Earlene said she did their colors and makeup, and the girls had a ball. The mother said everyone went out for dinner afterward, and the girls talked and talked all evening about their colors and makeup and what fun they had had. One of the girls said, "You know, Mrs. Herman is OLD...but she's really, really COOL." "Passive" fund raising! Enjoy a meal at Three Doors Down and let them know you support Zonta. The owners will pay our club 10% of your entire bill (including drinks). Please thank them for their generosity. Eat, drink and support Zonta! To all the Zontians who worked April 26 on Lucy Arellano's house: Pam Sufak, Teri Hermans, Helen Smithwick, Shannon Rowan, Liz Groothoff-Croddy, Kathy Fortner, Janet Fuehrer, Betty Hudson, and Ellen Slavitz. A special Kudos to Pam for her special connections - she acquired over 200 flowering bulbs and a huge bag of mulch. To the four Zontos who also worked on Lucy's house: Jim Fortner, Jerry Hermans, Tim Rowan and Jeff Wells. Without your expertise, patience, and talent we could have never accomplished our goal. Thanks a bunch. You truly embody the mission of Zonta: to advance the status of women. Lucy is a lucky lady because of you four!